Some of the strange things some people believe. Most people wouldn't decide to insure half the value of their new car, so why do many Australians only have half the life insurance cover they need? There are a number of reasons - people think they already have enough, they believe they don't need insurance or they think that its too expensive. But many of these reasons are more myth than reality. Let's face the facts and debunk some myths. Unlikely. Remember the minimum level of cover provided via your super fund is automatically set with all members in mind so it's unlikely to be exactly the level of cover you and your family really need. More likely than not, it wouldn't cover all or even most of your debts. Make sure you contact your super fund to find out your level of cover and then speak with us for a comparison. This would be nice but it's not really the case. Centrelink currentlh will pay a maximum disability pension of $797.90 per fortnight for singles and $601.50 for couples. Would this cover your current lifestyle? This equates to less than $43 a day for a couple. You can see those numbers for yourself here. Not usually. Workers' compensation only covers accidents or injuries that occur during working hours or for an illness that's the direct result of your employment. The majority of accidents and illnesses occur outside the workplace. So if you want to protect your lifestyle and your family it's unwise to rely on workers' compensation alone. For most Australians insurance is very affordable. For example, a 35 year old male, non-smoker applying for $500,000 of Life Insurance cover the monthly premium would be approximately $40. A 35 year old female, non-smoker applying for $500,000 of Life Insurance cover the monthly premium would be approximately $35. That's peace of mind for less than the cost of a coffee a day. If you have some existing cover, increasing this to adequate levels may cost you even less than that coffee. Depending on your circumstances, you may be able to have your Income Protection insurance premiums paid from your employers superannuation fund at a lower tax rate than your current income tax rate. Simply not true. Insurers do pay claims. In fact, Life Insurance companies pay out almost $13 million every working day in claims to customers2. This figure would be even higher if the Australians had adequate levels of cover. Sapience clients have received in excess of $5,000,000 in claim payments. Insurers are in the business of giving people access to insurance at an affordable price. If they failed to do this, they wouldn't have a business. Data from IFSA indicates that around 93% of applicants pay standard premiums for their life insurance3. People who have a higher risk of developing chronic illness or who work in high-risk occupations are usually required to pay an extra premium to cover this risk - but this only applies to a few people (the remaining 7% of applicants). And only a very small number are not able to be covered at all. Unfortunately, this is not the case. 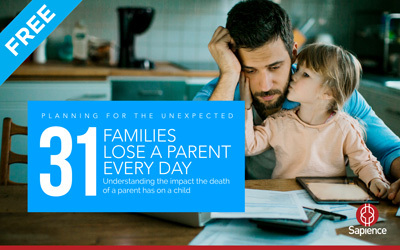 In fact, research shows that 60% of families with dependent children do not have enough insurance to cover the household expenses for a year if the family bread winner were to die4. We also know that on average those that have death cover through their super policy have less than half the level of cover they need5. Ironically, most Australians insure their homes and cars (even their smartphones) but less than a third insure their most valuable asset - their ability to actually earn an income. This causes unnecessary hardship for numerous Australians. Contact us today here, simply leave your details and request a callback.